CHICAGO—Thresholds, the state’s largest provider of mental health services, won citywide recognition February 17th for work on Fred and Pamela Buffett Place at Local Initiatives Support Corporation (LISC) Chicago’s 21st Annual Chicago Neighborhood Development Awards (CNDA), the city’s premier forum for recognition of development projects. Thresholds won the Richard H. Driehaus Foundation Award for Outstanding Non-Profit Neighborhood Real Estate Project for its work converting the derelict Diplomat Hotel in Lakeview into an affordable housing building with upgraded features. The award, accompanied by a $15,000 prize, recognizes a community development corporation for a real estate project that has contributed significantly to the enhancement of the community. Landon Bone Baker, the architects for the project, were also recognized for their work on Buffett Place with the Richard H. Driehaus Foundation Award for Architectural Excellence in Community Design (1st Place). Built in 1929, Buffett Place, located in Chicago’s Lakeview neighborhood, was most recently a SRO building that suffered from years of mismanagement and neglect. Buffett Place represents an innovative and transformative public-private partnership between the City of Chicago, Alderman Tom Tunney, Brinshore Development, Landon Bone Baker, and Thresholds. After several code violations, the city acquired the building, and project partners Brinshore Development and Thresholds submitted a successful bid to preserve the building as affordable housing. Thresholds has managed the building since its opening in early 2013, and provides supportive services, mental health services, and healthcare coordination both to residents of the building and those in the surrounding areas. Buffett Place is fully accessible, disability-neutral, and contains a number of amenities for residents beyond supportive services: a community space and lobby, an exterior courtyard, a roof garden and deck, offices, laundry rooms, computer lab, and exercise room. “The design of Buffett Place by Landon Bone Baker provides residents, many of whom have experienced or been at risk of homelessness, a truly beautiful and dignified place to begin their recovery. 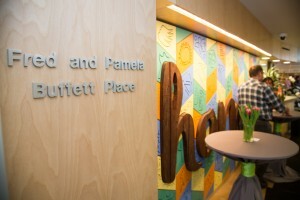 My late husband Fred and I are so honored to be a part of a project that helps our most vulnerable citizens,” says Pamela Buffett, a longtime Thresholds donor and philanthropist for whom the project is named. All mechanical systems and appliances meet or exceed criteria checklists for Enterprise Green Communities and Chicago Green Homes. Buffett Place’s design includes Energy-Star rated appliances, low VOC materials and finishes, a green roof, and use of reclaimed materials. Buffett Place has also been awarded honorable mention for Green Housing in the Charles L. Edson Tax Credit Excellence Awards. Created in 1995 by LISC Chicago, the Chicago Neighborhood Development Awards celebrate achievements in architectural design and community development in neighborhoods across the city. All winners were selected after extensive review by teams of judges. About Thresholds: Established in 1959, Thresholds provides healthcare, housing, and hope for thousands of persons with mental illnesses in Illinois. Through research, employment, advocacy, care, and housing, Thresholds assists and inspires people with mental illness to reclaim their lives. For more information about Thresholds, please visit our website at www.thresholds.org. About Landon Bone Baker Architects: Landon Bone Baker Architects is a hands-on, full-service architectural practice. The Chicago-based firm has earned a strong reputation for bringing responsible design to affordable housing and neighborhood planning. Landon Bone Baker Architects is distinguished by a community-based approach, working closely with neighborhood organizations, not-for-profit associations, and developers of affordable housing to create the best possible solutions for residents. The firm’s growing portfolio of projects ranges from large to small scale urban developments; from single-room-occupancy buildings to affordable apartment rehabilitations; from daycare centers to college dormitories. Learn more at www.landonbonebaker.com. About Brinshore Development: Established in 1994, Brinshore Development, LLC is an innovative real estate company specializing in the development of residential communities that foster conservation, collaboration and affordability. Brinshore has undertaken dozens of developments, from large-scale master planned communities to the restoration of meticulously preserved historic properties. The Brinshore portfolio today encompasses more than 4,000 residential units valued at more than $1 billion. Learn more at www.brinshore.com. About LISC Chicago: LISC Chicago connects neighborhoods to the resources they need to become stronger and healthier. Part of the national nonprofit Local Initiatives Support Corporation, LISC Chicago provides grants, loans, technical assistance and other resources to more than 70 partner organizations in low- and moderate-income communities across Chicago. When neighborhoods are connected to the right resources and work together to advance robust, coordinated community development plans, they are better positioned to participate in the region’s economic growth. For more information visit, lisc-chicago.org. This entry was posted in News and tagged Buffett, chicago, CNDA, Diplomat, housing, Lakeview, LISC, mental health, mental illness, Pamela Buffett, SRO, Supportive Housing. Bookmark the permalink.